Cold mornings here on the farm. Some discussions about the CAP moving towards a uniform payment per hectare. Now that would suit me just fine. Australia’s pasture cropping system is something I’d like to try, but a direct drill is way expensive. Bruce King has bald eagles watching his sheep in Washington State. Irish Farmerette is in the midst of a compact birthing schedule on her dairy farm. That’s a lot of calves in a short time. Green Machine Farm is building nest boxes. Tosca’s ancestral home now has a site: Beauchasseur Golden Retrievers. I’m nearly caught up after the reconnection of the Internet. Thank you, Telephone Operator! Just looking at that photo makes me cold! 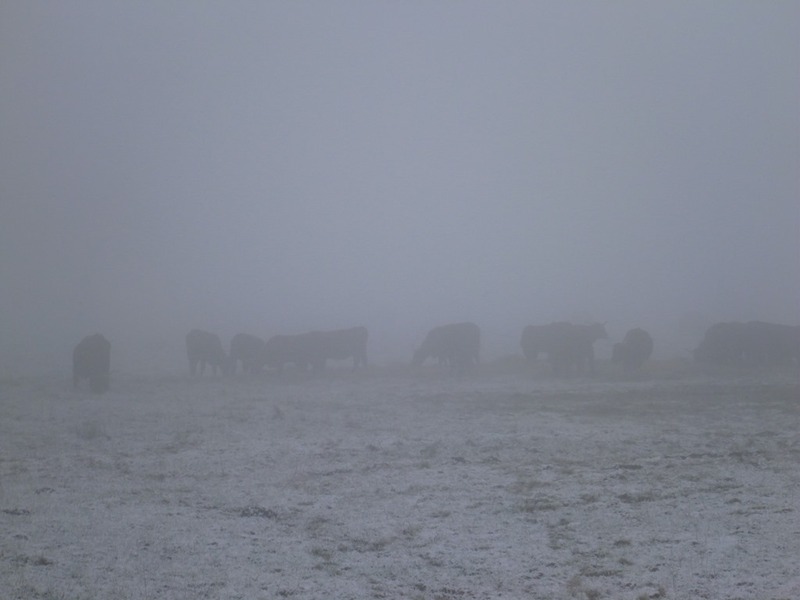 I like the cows in the mist. Thanks for sharing a link to my blog! And you’re right, it’s scary when cows do that, especially pregnant cows. Fortunately, they were just watching from the soggy barnyard.